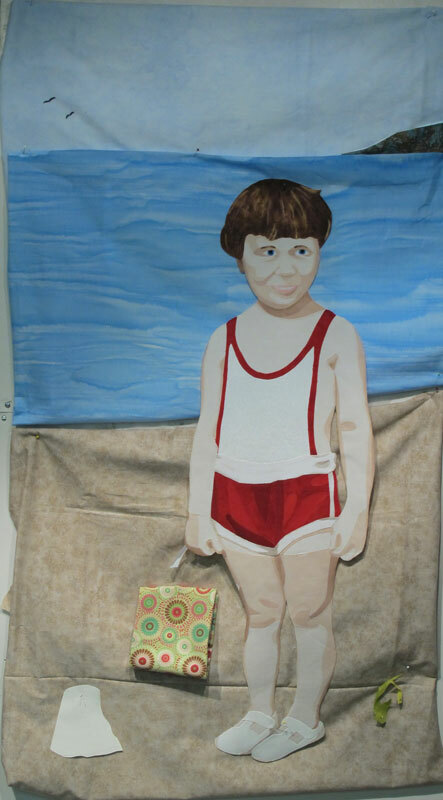 My latest vintage portrait is one of a little girl with a sand pail. I loved her smile, the funky sun suit, pail and sandals. Don’t you just love the tan line on her legs? It looks as though she normally wears longer shorts. 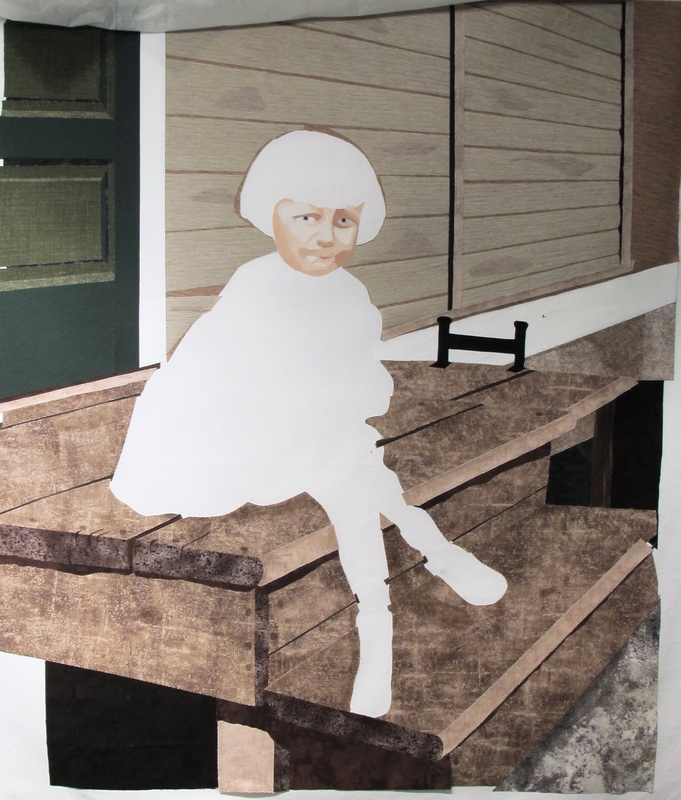 Since so much of her face is in dark shadow, the trick was to create what I couldn’t see. I think that she is coming along fairly well. Her face will gain more definition after adding stitching. 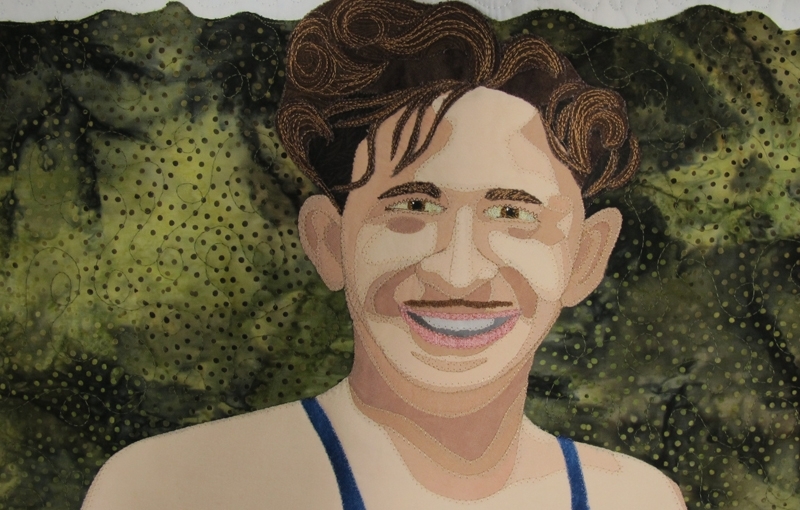 It is always hard to remember that the stitching adds so much life, and detail, to the portrait. And now, I see below, that I need to move one of her irises, as she is looking a little cross-eyed. I have changed her hair twice now, as I didn’t like the first set of highlights that I did. And originally I had given her a little flip of hair on the left side but decided it looked odd, so cut it off. I like the rounded look of the cap of hair better. Do you make adjustments as you work, or do you keep to a set path in your work? I find photos a great help for me to notice little things that need adjusting. It is so easy now with digital cameras! 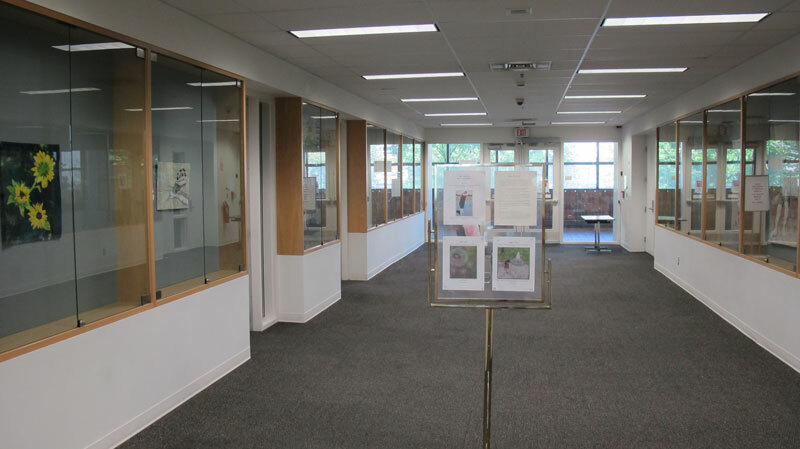 Do you take photos of your work as you go? 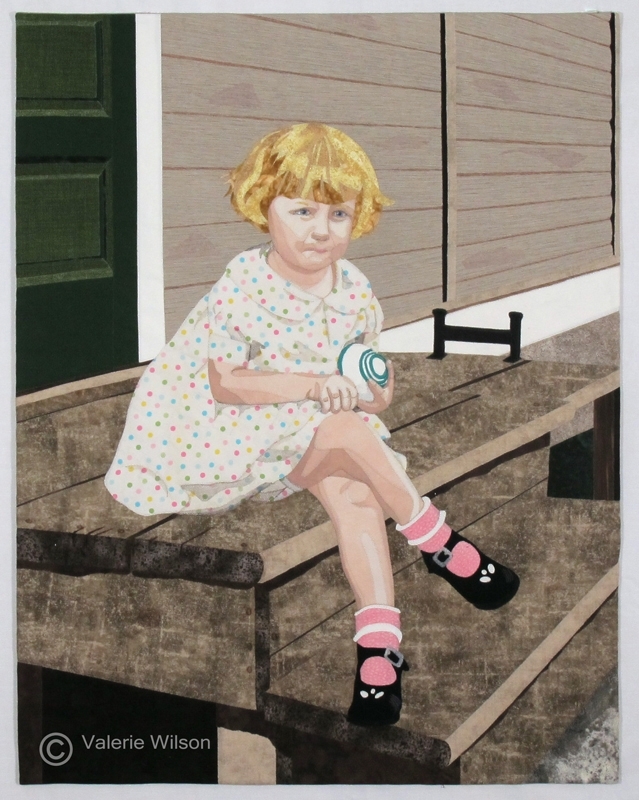 This entry was posted in Uncategorized and tagged children, fusible applique, photography, portraits, vintage clothing on July 6, 2015 by Valerie Wilson. 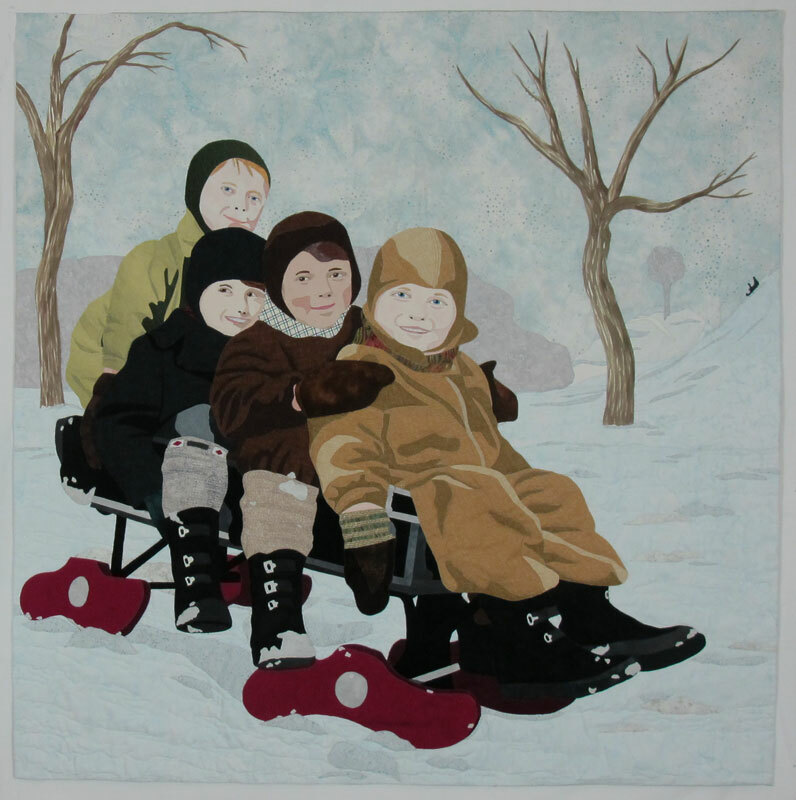 “Fun in the Snow” has been completed! Thanks for all the suggestions for names! I didn’t quite finish it by my deadline of the 15th of June. However, I wasn’t far off, as I had it quilted and blocked by the 18th! 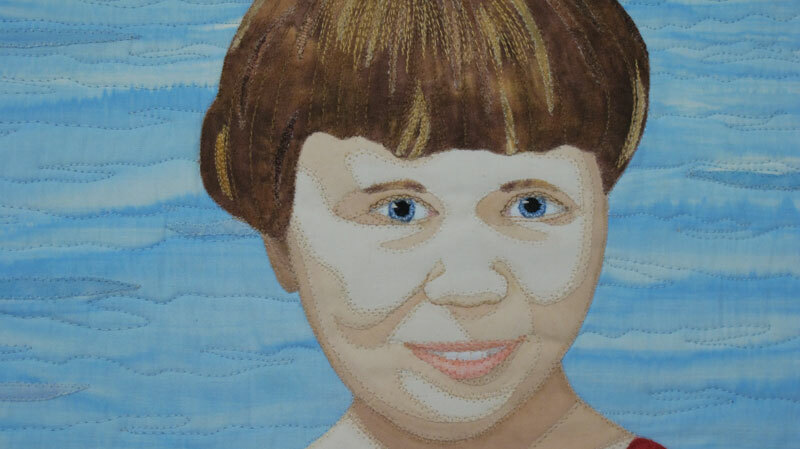 The faces looked a bit too wrinkly, so when I blocked the quilt, I blocked the faces separately, along with the edges of the quilt. It worked great! The faces look better now. Just the sleeve, and the label, to add, which I will do when I take a break to watch TV. I wish that you could see it up close. The sparkle on the snow fabrics is really great. 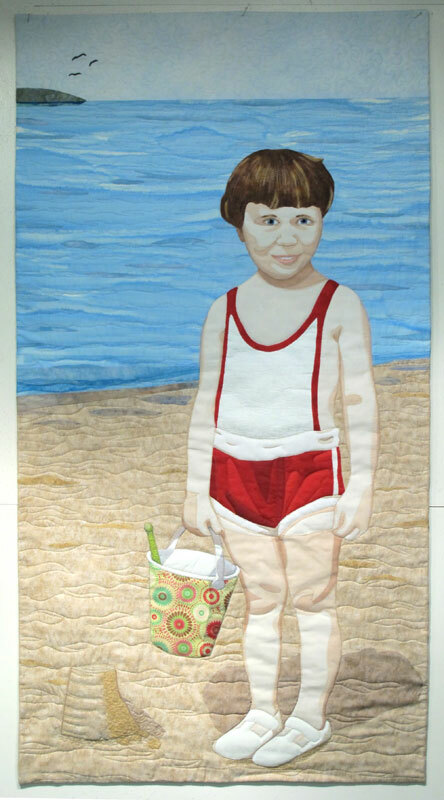 I quilted it on my HQ Sweet 16, and found it easier than using my regular sewing machine. All that throat space is quite wonderful! 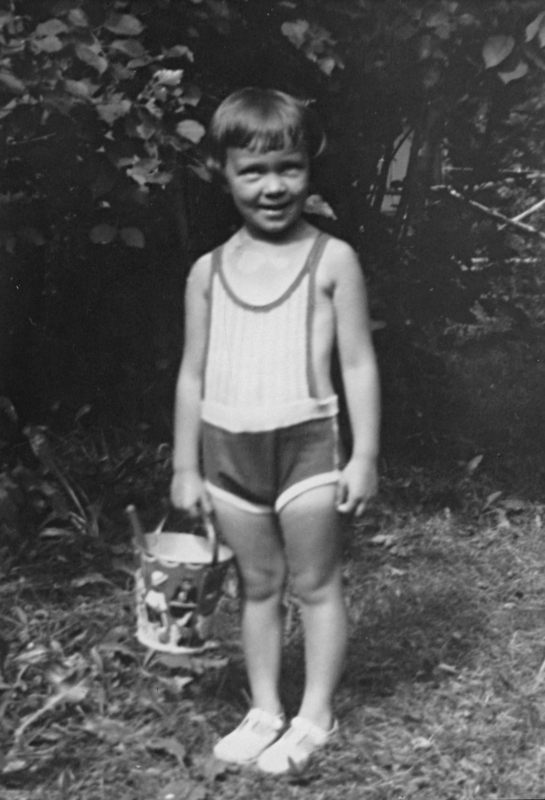 I am now on to the next project – a little girl in a sun suit and sandals, holding a sand pail. Keep watch for updates coming soon!! I am now on to the next project – a little girl in a sunsuit and sandals, holding a sand pail. Keep watch for updates coming soon!! This entry was posted in Uncategorized on June 26, 2015 by Valerie Wilson. Exciting news! 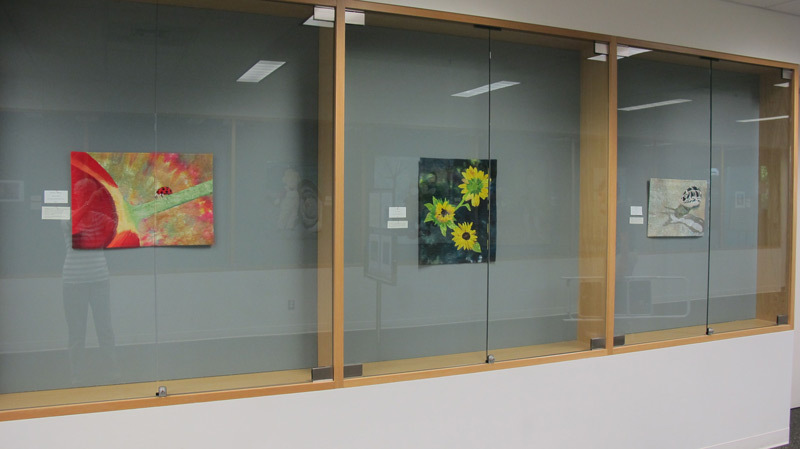 I will have an exhibit in the Portage & District Arts Centre Gallery, in Portage la Prairie, MB next year, from April 4 – May 14, 2016. The exhibit will be called “Past Lives“, and it will feature my portraits created from vintage black and white photographs. 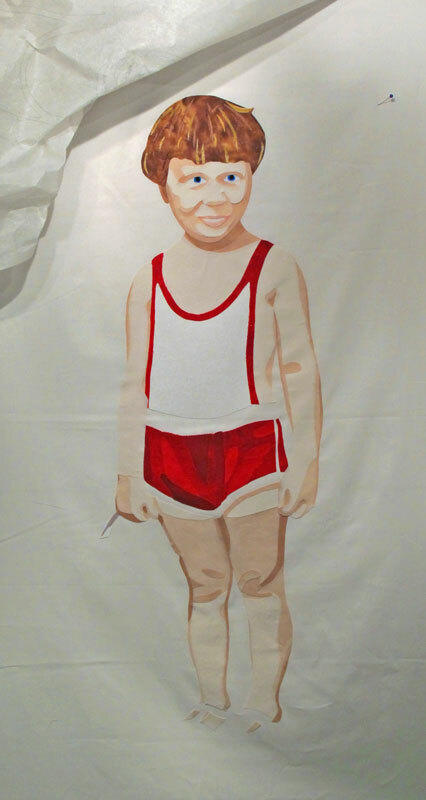 To celebrate, I am planning on featuring my progress here in my blog, as I work on various portraits for the show. 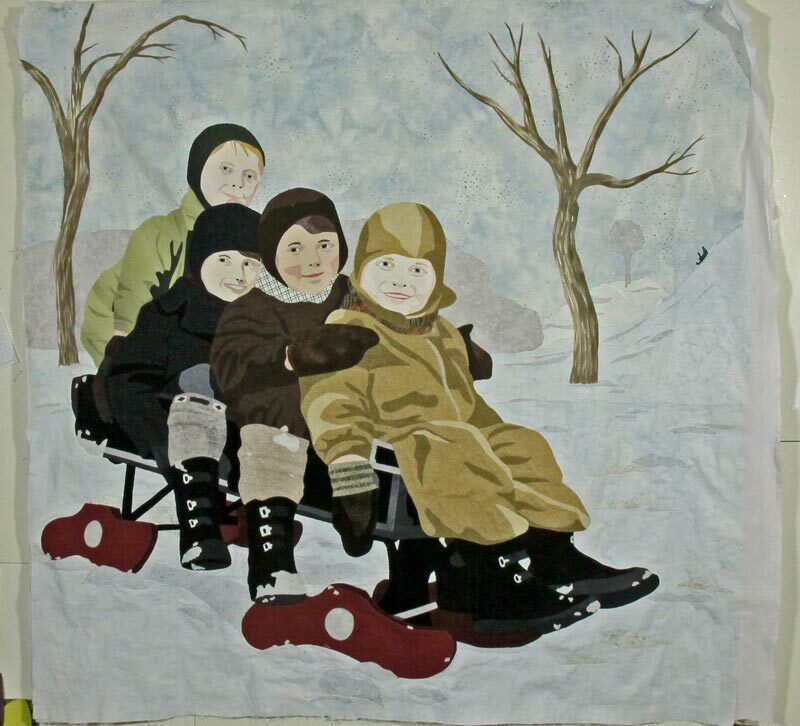 The first one is four little boys on a sled. 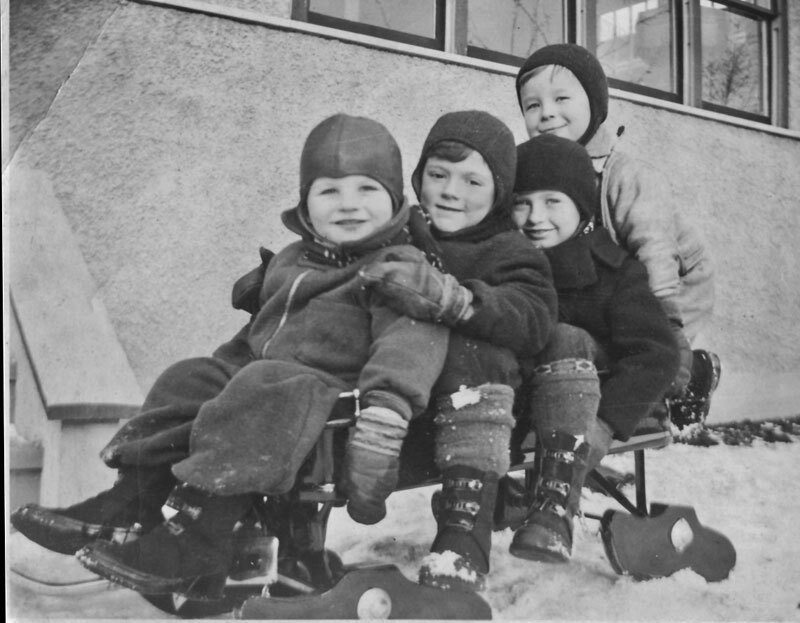 Original photograph of four kids on a sleigh. 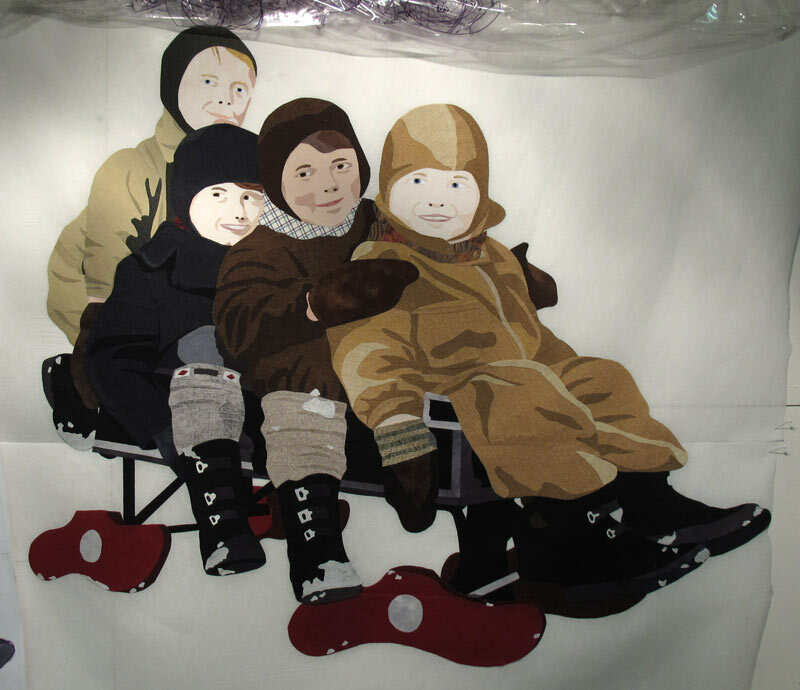 I loved the four children piled on to the sleigh. 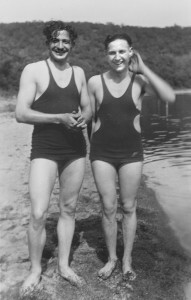 They looked like they were having a lot of fun. Note: In my research on this unusual design of this sleigh, I found out that this is considered a bobsled. The definition is a sled, or sleigh, with the front runners moving independently of the rear ones. I found some pictures of log pulling sleighs with similar runners. The idea is if the front runners move separately from the back, the sleigh will go around corners easily. Having recently learned how to select part of a photo, through a Photoshop Elements class at Pixeladies I removed the kids from their background – a rather boring part of a house and changed the direction they were heading. I plan on creating an outdoor setting for them. I then enlarged the photo to the size that I wanted. I traced the main elements on to a plastic overlay this time. 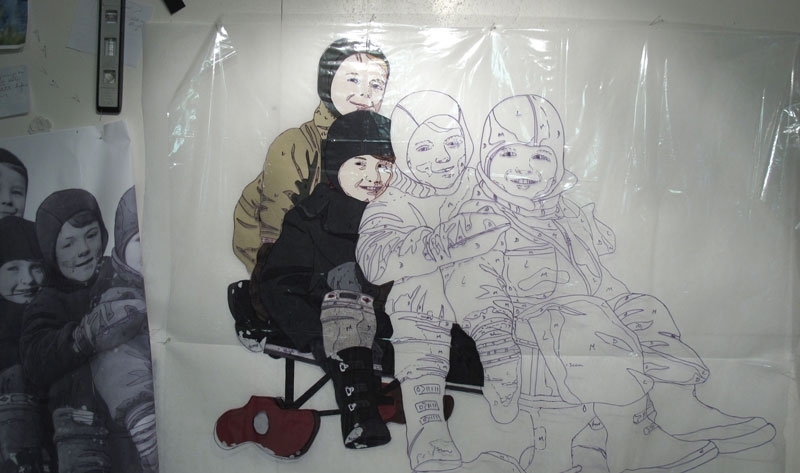 Usually, I use tracing paper but thought that I would give this method a try. It didn’t work that well for me, although I know of many artists who use plastic all the time. 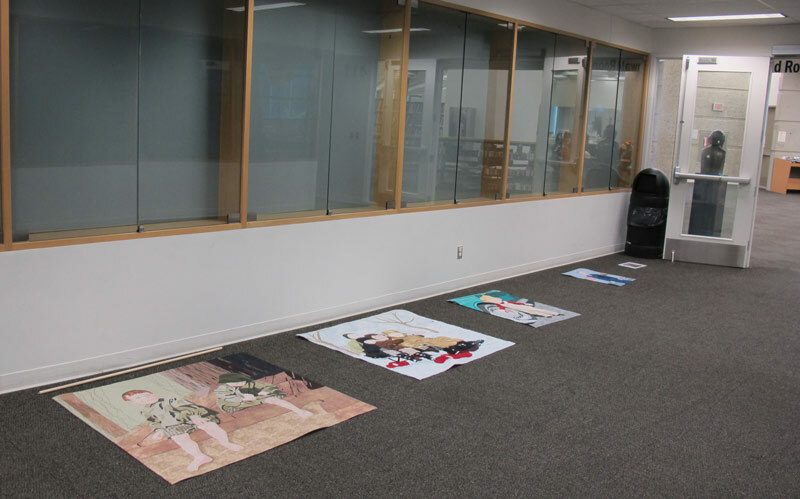 First, I found the plastic much heavier to lift, and second, that somehow some of the fabric pieces ended up stuck to the plastic when I raised it to add another piece. Very irritating! 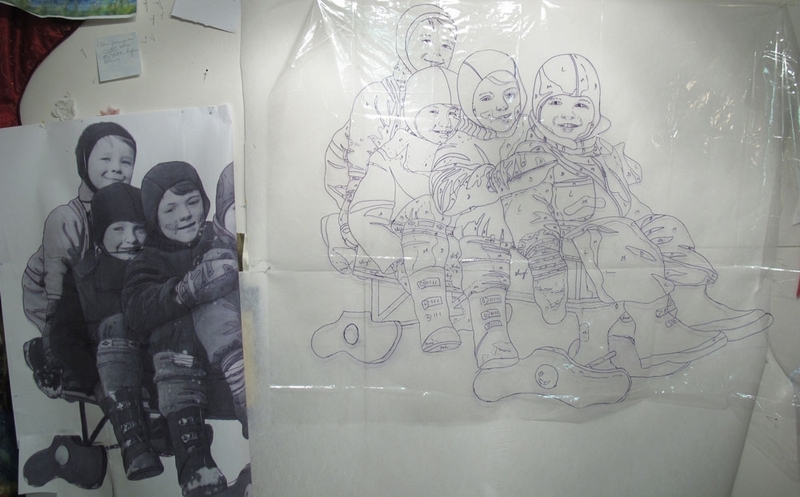 I think that I will probably go back to using tracing paper. Anyone else with a preference for or any hints for using plastic as an overlay? 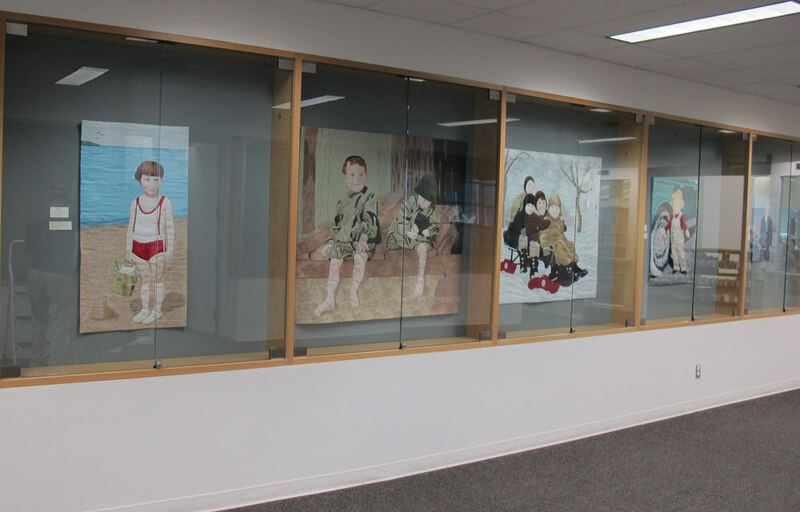 Once I got started on the kids, I really enjoyed putting the pieces together. 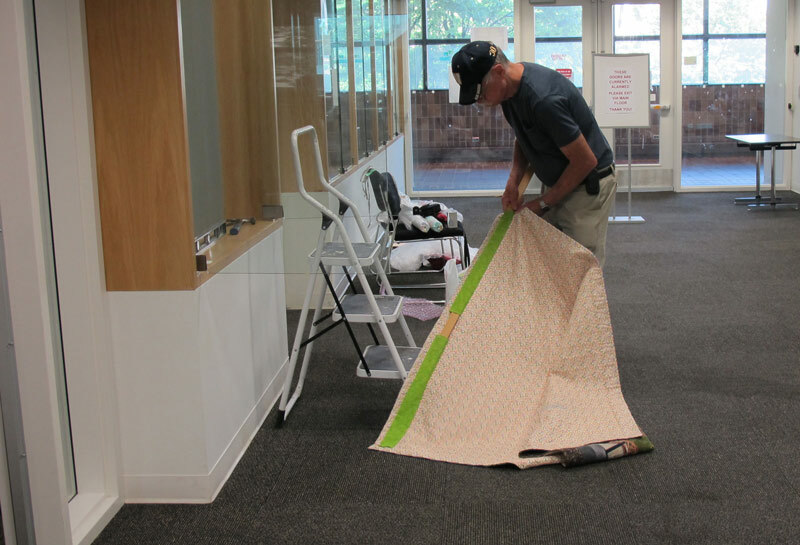 I had discovered some cotton fabrics at a local quilt store, Quilt as Desired, that looked like various woven or linen fabrics, and came in 3 or 4 values of the same colour. A real bonus when doing portraits! A lot of the fun of doing these vintage portraits is researching the elements in the photos. All the kids had those old fashioned rubber boots with the metal closures and big loose mitts. It was fun finding different fabrics for the mitts and socks. Did you know that in the 1930s McCall’s patterns had patterns for these snowsuits complete with the helmet-like caps? 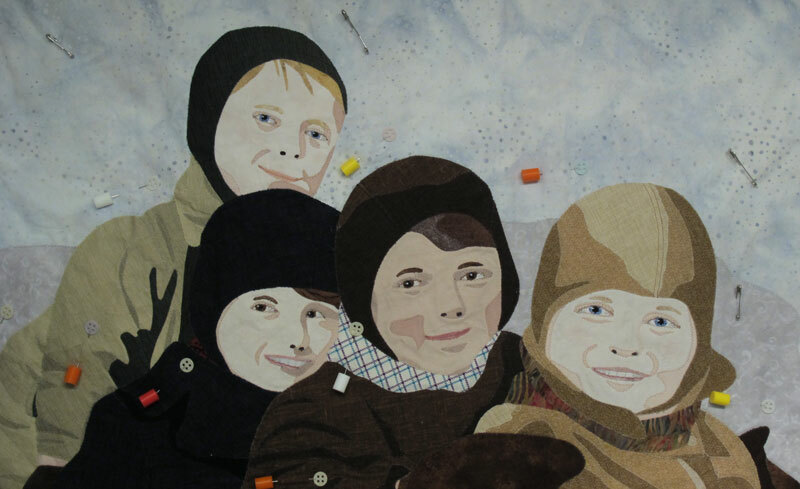 Now on to finishing these four guys before I go to Quilt Canada on June 2! 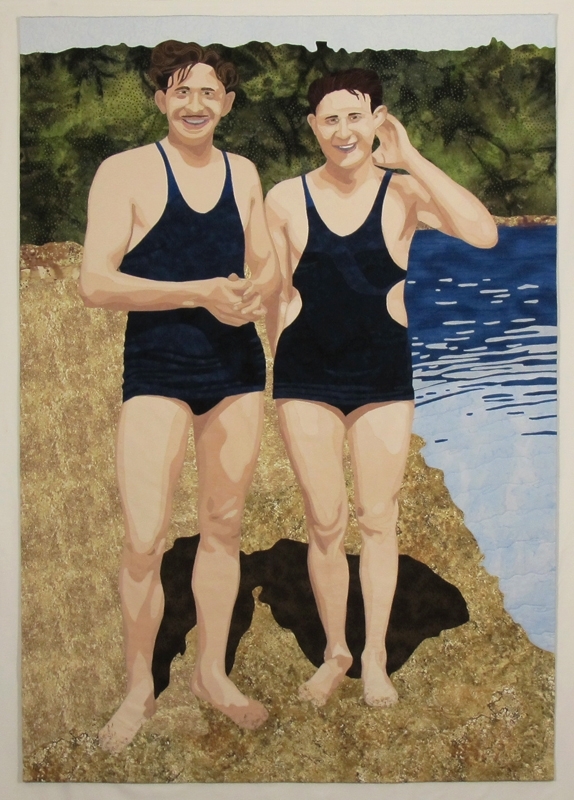 I have two quilts, Stepping Out and The Bather, in the Juried show and am soooo excited about seeing them hanging in the show. 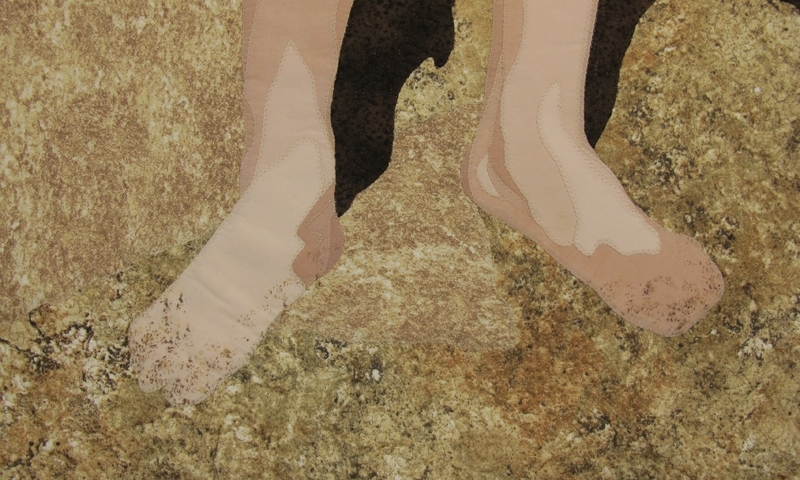 Keep posted for future developments in the work involved in getting ready for a solo show. To easily follow my blog, subscribe to my Studio Updates (the box on the lower left). 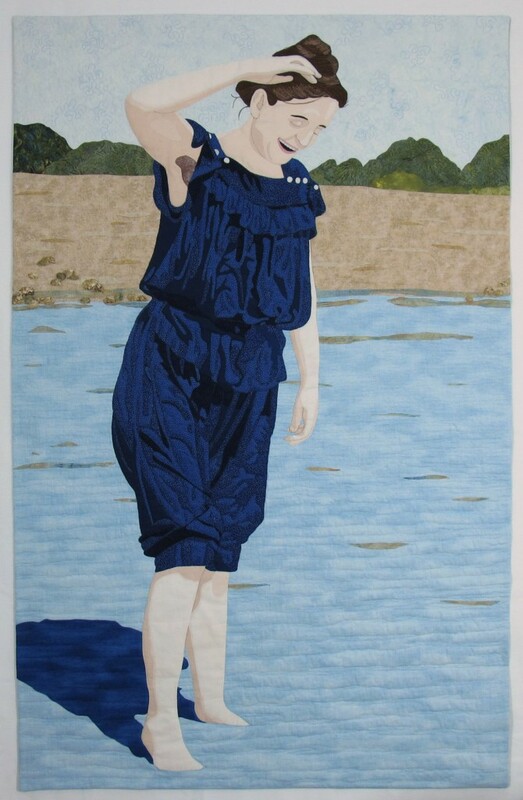 This entry was posted in Uncategorized and tagged children, fusible applique, portraits, vintage clothing on May 29, 2015 by Valerie Wilson. Let there be light! 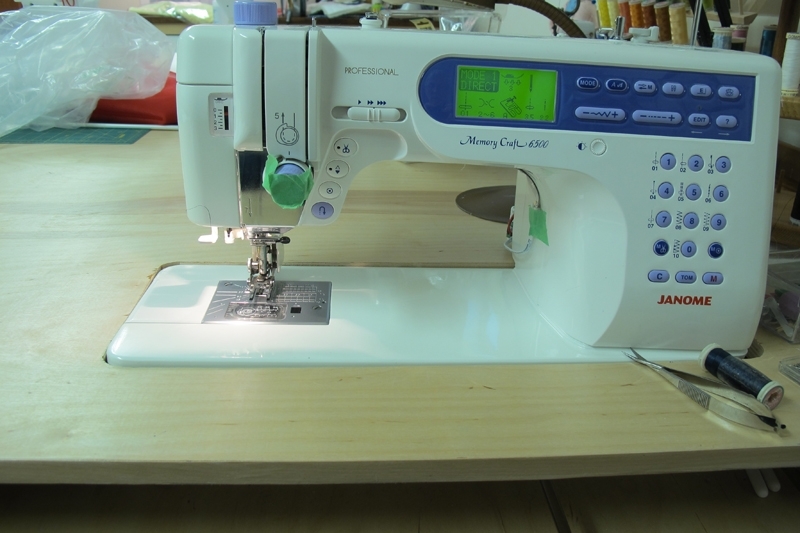 Adding an LED lighting strip to Your Sewing Machine. 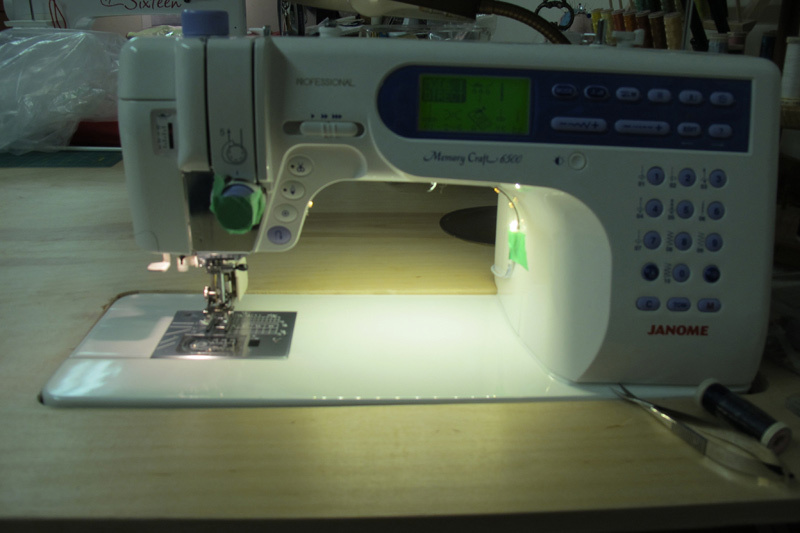 The thing that I most wanted for a Christmas present this year was LED lighting for my sewing machine. And, oh joy!, I go it! 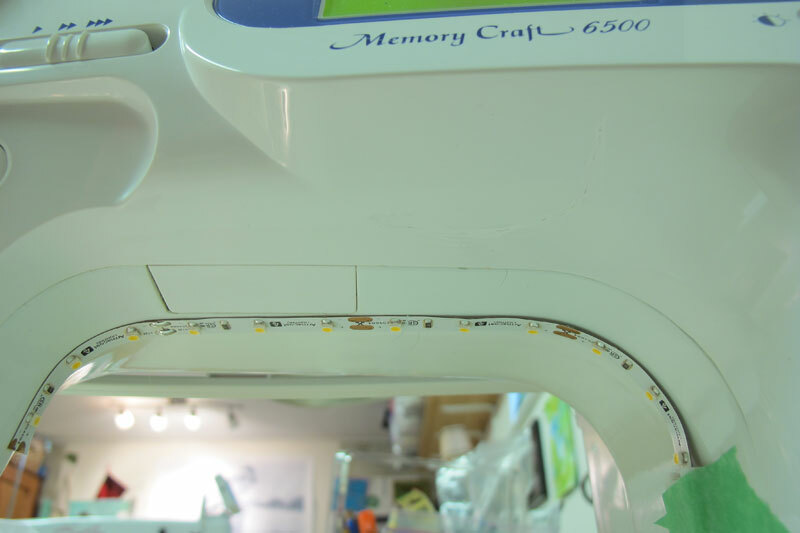 The LED light strip, with self-adhesive backing, mounts under the throat of your sewing machine. Once switched on you have lots of light, exactly where you want it! This was my sewing machine before, with just the usual sewing machine light turned on. A pool of light around the needle. Here is how the LED strip looks on my machine. I have tape holding the connector in place, but will replace this with double-sided tape, placed behind the connector. I added a dimmer switch for those times when I don’t need as much light. You could add a regular switch or plug it into a receptacle. The whole setup cost $44.50, before tax, at Lee Valley Tools . 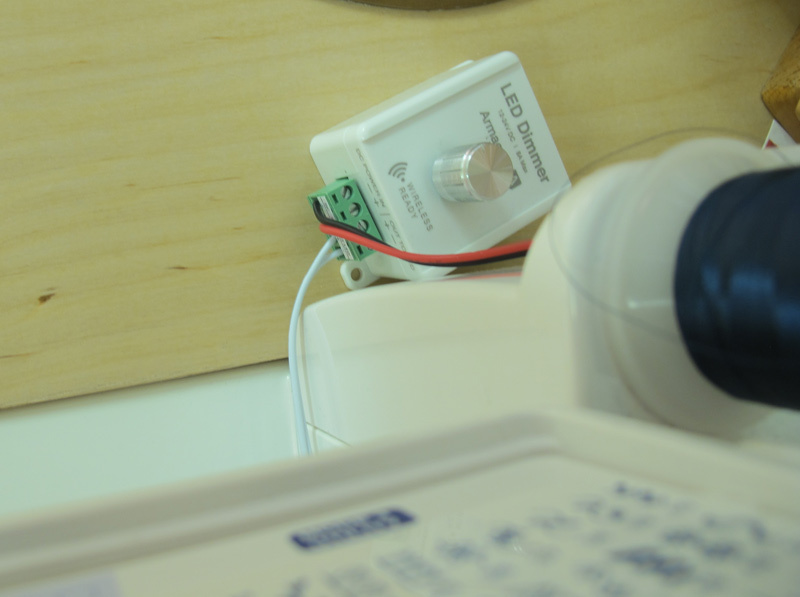 The parts purchased were one foot of LEDs (minimum length you can buy), a lead wire to connect the LED strip to the switch, a dimmer switch and a power supply. Since I only used half of the light strip on this sewing machine, I have another 6″ to use elsewhere. The cost without the switch was $21.00. And the power supply sits next to the sewing machine. I am quite pleased with how these lights work! I can now easily see my stitching, but find it especially helpful when I do free motion quilting with light thread on a light background. 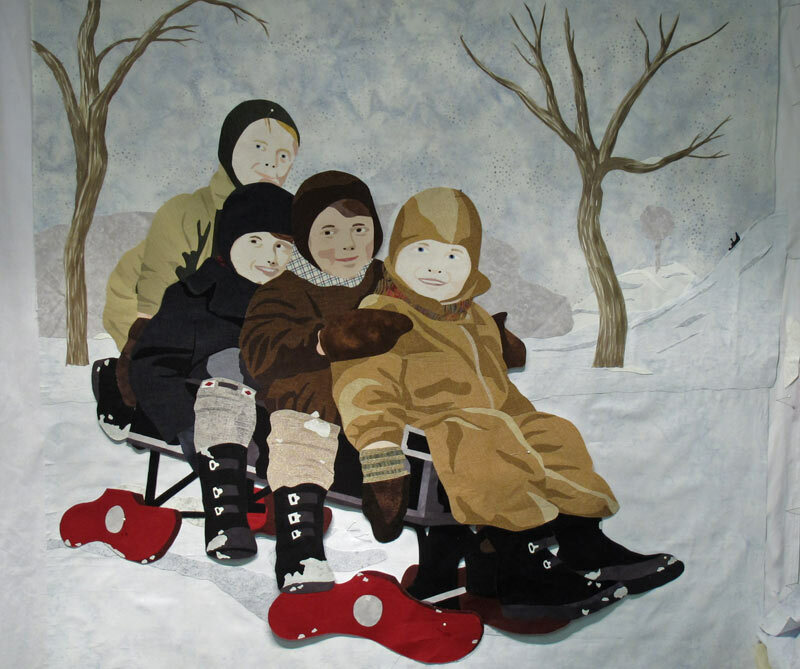 This entry was posted in Uncategorized and tagged LED lights; quilting;sewing machines, quilting on January 8, 2015 by Valerie Wilson.